If like me you wash your hair everyday on holiday (a days worth of chlorine or sea water sends my hair wild) you're probably wondering why I'm taking along a dry shampoo. Now although I won't be using it to refresh any oily roots between washes, I will be using it for volume and texture and to give my freshly washed hair a bit of body instead. Plus it smells like cherries, yum! I've used the volume version of these vo5 shampoo and conditioners in the past and absolutely loved them. I found the shampoo lathers up really nicely and the conditioner makes my hair much more manageable and tangle-free. However, as I'm going to a hot destination, I decided to try the moisture range instead. My hair is prone to drying out and sitting in the sun all day will only add to that so I'm hoping this will help my locks remain healthy and glossy. I also thought these bottles were an ideal size for a weeks worth of use too - not too big and not too small. I can't say this is hairspray of choice but it was the cheapest mini I could find. I don't use hairspray a great deal so I wasn't willing to splash out on a mini bottle for one week away when I have humongous bottles of the stuff at home. This one is Boots own and has an extra firm hold so I'm sure it will do its job. When I'm on holiday, I'm very lazy with my hair. When its hot outside and there's humidity in the air, the last thing I want to do is use heat on it. 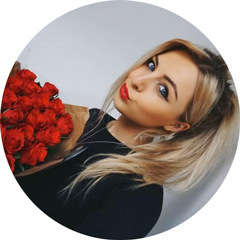 I tend to go for quick and easy styles like natural beach waves or top knots instead. Thats where a Sea Salt spray like this one from Toni & Guy comes in very handy. Just a quick spritz over the hair transforms locks from frizzy to 'messy chic'. I'm sure I'll be using this most evenings and the super cute mini bottle means its travel friendly too. After a long day of baking myself in the sun, I love nothing more than slathering on a cooling After Sun. Not only does After Sun sooth the skin and heal any burnt bits faster, it also moisturises and leaves the skin feeling supple and soft. As well as all that goodness, this one from Piz Buin also contains a 'tan intensifying' plant extract. Oooh, golden glowy skin, here I come. I bought this factor 20 Garnier oil to use on my arms and legs. You're probably wondering whey I'm only going to be using this on those areas but I'll get onto that in the next product summary. I really like the fact this is an oil SPF as I find them much easier to use than white lotions that seem to take forever and a day to absorb into the skin. I'm hoping it does what it says on the tin and helps me achieve a golden tan whilst preventing sunburn. Okay this is a little bit of a cheat as I was sent these products and didn't buy them myself. However, they are from Boots and they are a holiday essential so it made sense for me to include them. 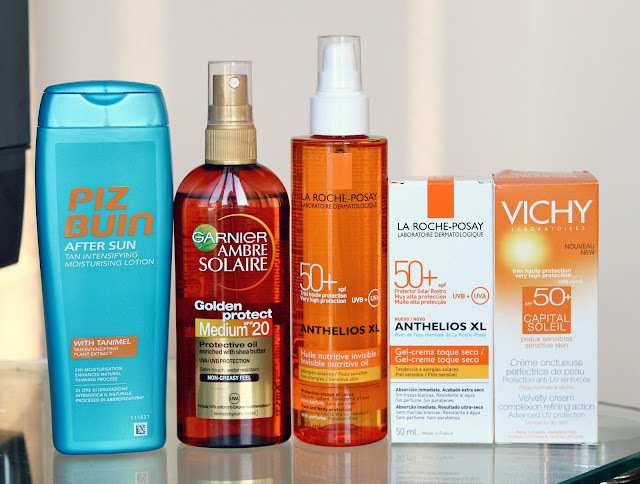 This new range of tanning products from La Roche-Posay are aimed at those who have very sensitive skin and need a high protection, hence the factor 50+. Now you might be thinking, "who in their right mind would wear factor 50, you won't get a tan". However, as someone with exceptionally sensitive skin and someone who once got so sunburnt they ended up getting an injection in hospital, wearing a high factor is hugely important to me. I'm planning on using the nutritive oil on my chest and stomach as they're both prone to sun burn and the gel-cream on my face which again, is very prone to getting burnt. Again, this is a bit of a cheat as it was sent to me along with the La Roche-Posay products and again its a high factor 50+ sun protection. Specifically designed for the face this SPF also contains hyaluronic acid and light silicone to instantly plump the skin and provide water resistance. I've tried it out as a normal moisturising cream and like most Vichy products, its absolutely lovely. It sinks in effortlessly and I imagine this will be a great one to slather all over my face without it clogging up my skin and making me look greasy. Yes I bought some face wipes, don't judge me. I know face wipes aren't the best things to use on the skin and they certainly aren't ideal to use instead of a cleanser but for a week away, they're handy to have. I decided to get these cucumber ones from Boots own range as the cucumber should have a nice cooling effect on my skin after long days in the sun. Also, when I go on holiday, the last thing I want to do is faff around with a laborious skincare routine. If I want to trade my expensive cleansers for some cheap face wipes for a few days, I bloomin' well will. I am going on holiday to relax after all. Shower gel - a boring yet essential beauty product. After long sweaty days in the sun, this Original Source shower gel with its zesty lime scent is sure to leave me feeling refreshed and clean. Another boring yet essential product this time in the form of a Sure deodorant. I'm sure you all know why I bought this. Other than the fresh cotton scent, nobody wants to risk ruining their favourite holiday outfit with pesky sweat patches. I don't know why but every time I go away on holiday, I buy a new razor. I've got no idea why the one currently sat in my shower just doesn't cut it (no pun intended) but it just doesn't. Does anyone else do this or is that just me and my strange habits? Anyway, this one from Venus comes with 3 blades and shower gel shave bars. This means theres no need to use a shaving gel as the nifty little gel shave bars help to protect the skin and provide a smooth shave. Oh, now I can't that "Ooh baby she's got it" song from the Venus advert out of my head. Damn! Another thing I buy before every holiday, hair ties and girps. As I mentioned earlier, I tend to throw my hair up in messy buns and what not when I'm away so these essential for helping me achieve that. I bought them both in blonde shades so they should go undetected in my hair. There's nothing worse than blonde hair with loads of black hair pins everywhere. No no no! 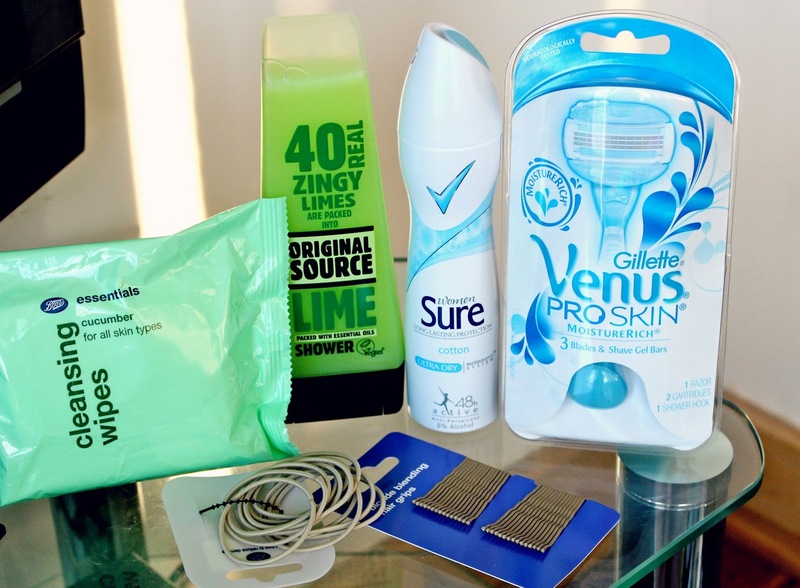 So there we have it, a few holiday essentials I picked up on a recent trip to Boots. Of course this isn't everything I'll be taking with me - I already had most of the other essentials like toothpaste, plug adaptors and insect repellent at home. You can't forget about insect repellent - those damn mossies! Have I missed anything? What are your holiday essentials? Love this! I'm holiday bound next week so I found this post really helpful. Geat haul love all the stuff you bought might pick some of it up for my holiday to after my exams thanks kayleigh. This post just makes me wish i was going on holiday!! I love everything you've picked! Great essentials! Love these kind of hauls as I'm going to Mexico and mallorca this year.. exciteddddd! Some great essentials you've bought! This is making me excited! I'm going on holiday next month and I can't wait to do this shop. That shower gel is one of my favourites it smells so good! This is just the holiday beauty checklist I needed, thanks! These are DEF summer holiday essentials. I also can't live without wipes. WIPES FOR EVERYTHING! Have a loooovely time on your 'holibobs' as you call them!! 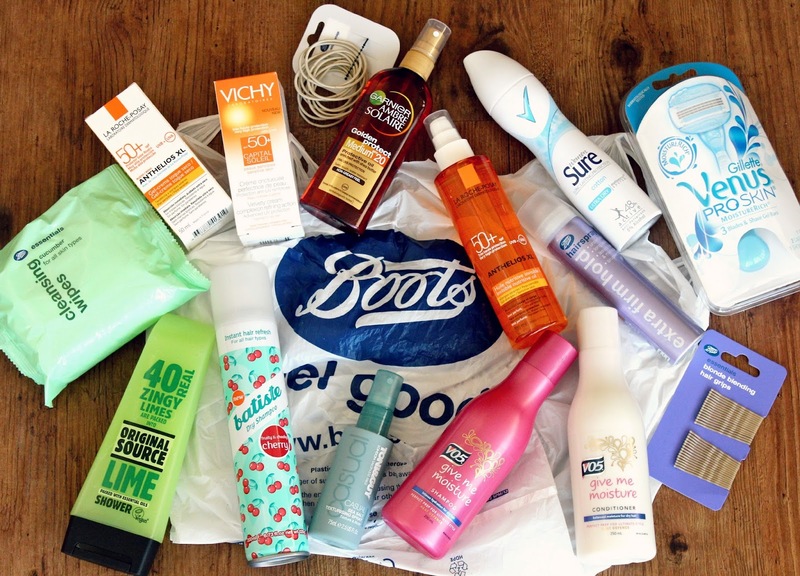 Popping to boots before going away to buy the essentials is all part of the fun of holidays - I love it! I feel your pain when it comes to sensitive skin. Once you've been burnt really badly once, it doesn't happen again! Factor 50 ALL the way! Who doesn't want the excuse to treat themselves to a little holiday haul?! That sensitive-tanning stuff looks great! Ooh very jealous of you going off on your holiday, and getting an excuse to have a spend in Boots ;-) I absolutely love the cherry batiste, smells so yummy! Great post! 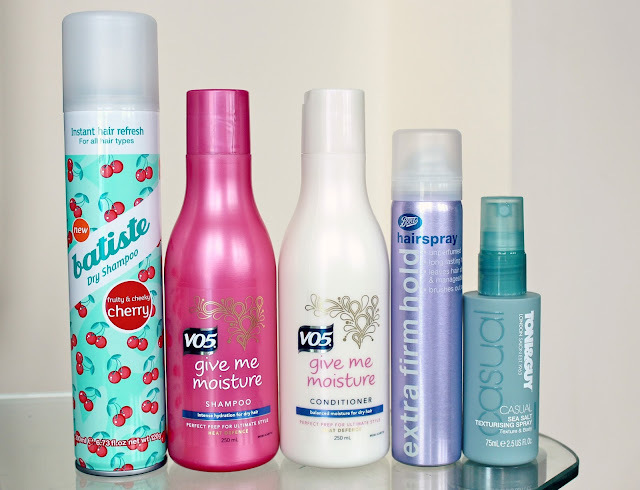 :) I have never tried the cherry batiste before.. think I need to splurge in boots now! I love the Piz Buin after sun! Turns me into a burnt mess into a golden goddess! The cherry dry shampoo is my all time fav and is usually half price in Superdrug! Thanks for the great blogpost! I should definitely check some of the picks!